When you delete an item it moves into the deleted items folder within your mailbox. 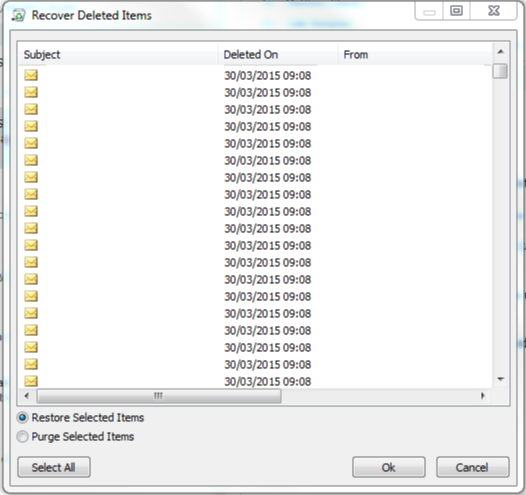 If you go into the folder and delete the item the way in which to recover them is the following. If an Item has been deleted for longer than 90 days, it cannot be recovered as it is purged from the mailbox. Once you have clicked on the Recover Deleted Items it will open the following pop up window. Select the items you wish to restore and select the Restore Selected Items check box and click Ok. These items will be restored to the Inbox or if the folder they were deleted from still exists, they will be recovered to that location.